Jimbei Yamada started selling his cult bikes in Tokyo back in 1972. His slogan, visible above the door to his shop, says it all: "Simple is Best". He sells basic designs available in 18 colours. Customers can buy them assembled or they can buy them as kits. Many customers chooose to assemble them themselves in the shop, under Yamada's supervision and under another sign that reads: "Your bike made by yourself". As Yamada says, "I realised that if I could do it, anyone could." In Yamada's eyes a city bike should be strong, narrow and light. Two of his most popular makes are the Yamajin and the Classic [pictured above]. The latter is no-frills - Scandinavian-style foot brake and sans fenders. 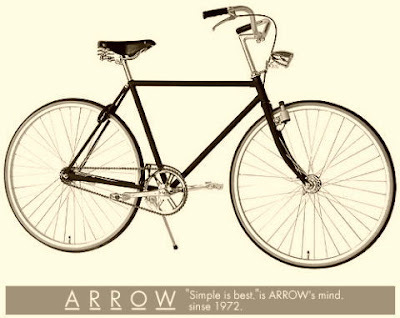 Arrow only produces about 1000 bikes a year. Yamada doesn't fancy the idea of expanding. Too much stress. He currently has his main shop and four franchises around Japan. He purchases the best parts and that is what makes his bikes so good in a world of cheap bikes. What endears us most to Yamada and Arrow is his disdain for branding. There is no Arrow logo on any of his bikes. "You've already paid for the product; I don't see why you should advertise it too", he says. How refreshing. How cool. We like Yamada and we like his Arrow bikes. Their website is in Japanese but feel free to have a look and give him a click to tell him we love Arrow.